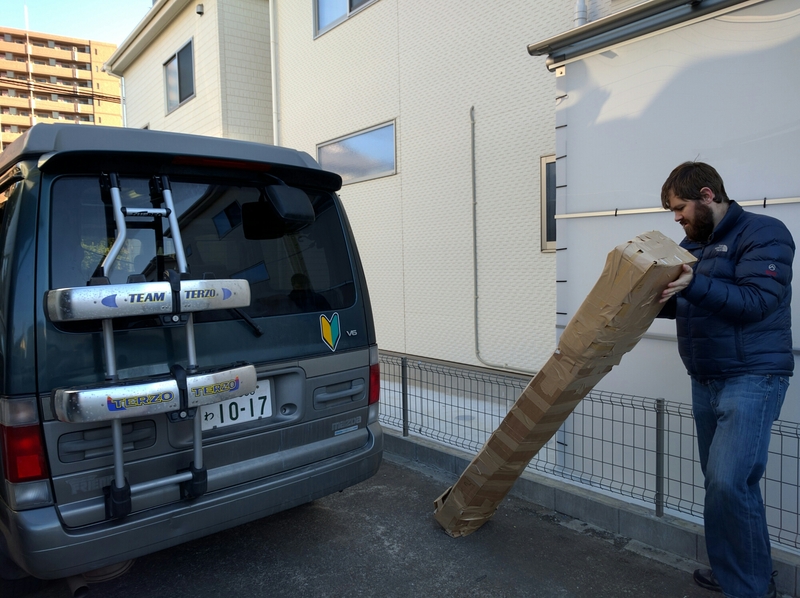 After much van cleaning and packing, we returned the van to Japan Campers and boxed up the ski gear. 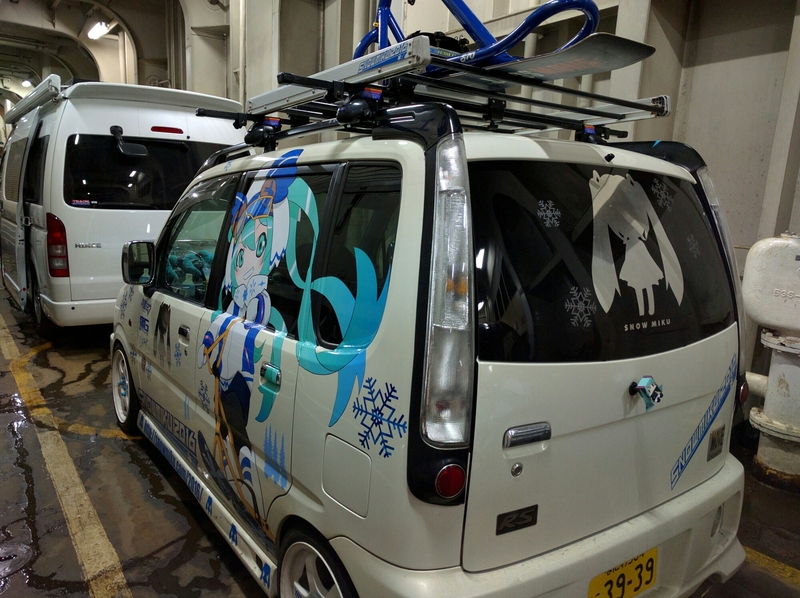 It felt good to have ditched a bunch of our extra stuff, but we were both sad to say goodbye to the Japan ski portion of the trip. We didn’t have too much time to dwell on this because we were running late to meet up with Rob’s Microsoft friend, Scotty, who was in town for a ski trip. 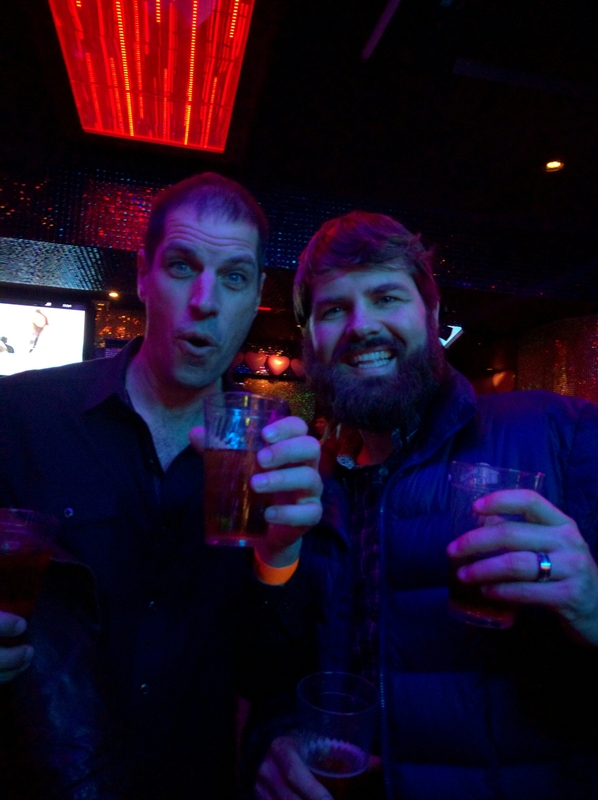 After dropping bags at the hostel, we headed to Roppongi for a night out. It turned out that Siamak, another Microsoft friend from the Tom’s office group, had come along too and a number of their other friends. Thus, we had a good group for dinner. After dinner and some Royce birthday chocolate, Rob, Siamak, Scotty and I went to check out happy hour at Jumanji 55. All you can drink between 7-11pm for 1000 yen/$8.60 USD for guys. Women drink all night for that price. The crowd was interesting. We stayed until 11pm then hung out at the airbnb that Scotty and Siamak were sharing. 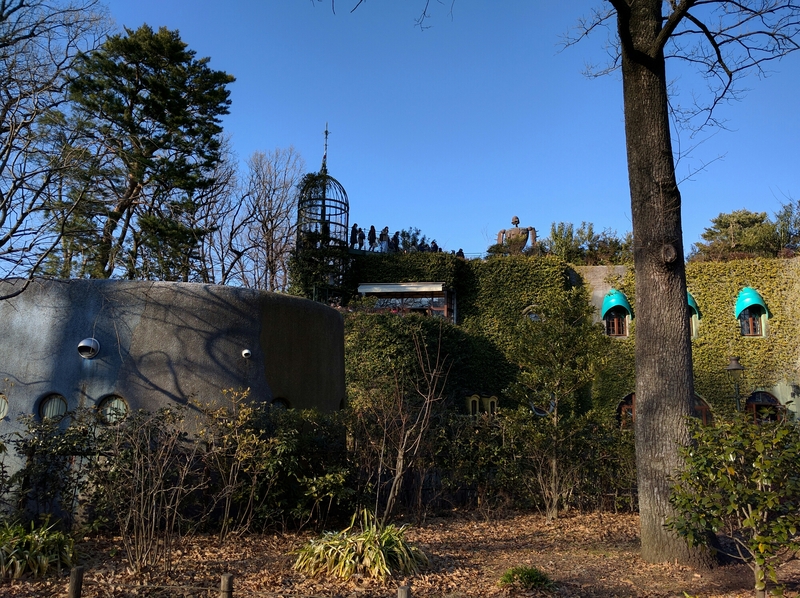 For our last day in Tokyo, we did some planning them finally got to use the Ghibli museum tickets that we’d been sitting on for a month. No pictures are allowed inside or else there would be tons here. 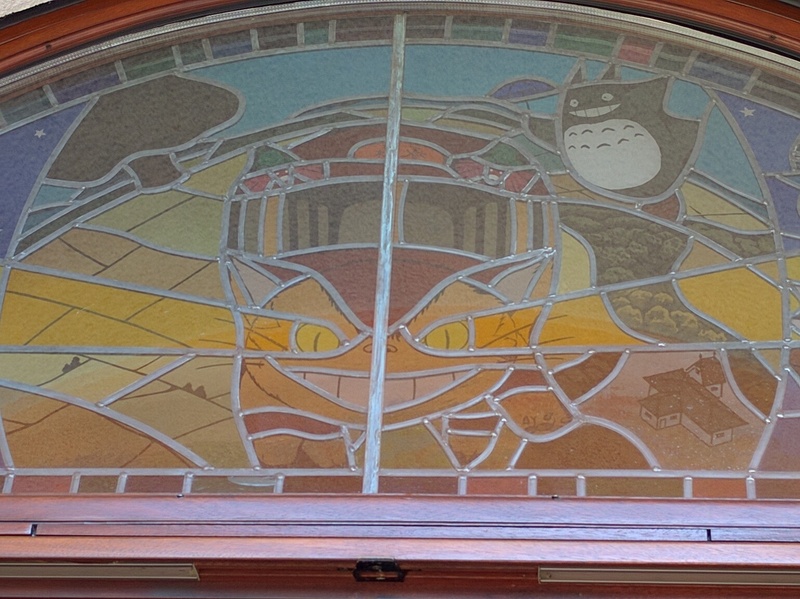 The building was extremely neat with lots of touches from the films. Half the fun is wandering around. There’s a massive plush cat bus for kids to play on, but Rob didn’t think I could pass for that young. Next stop, the airport and on to Bangkok! Since the ferry would take 19 hours, we had plenty of time there next day to sleep, relax and bathe. 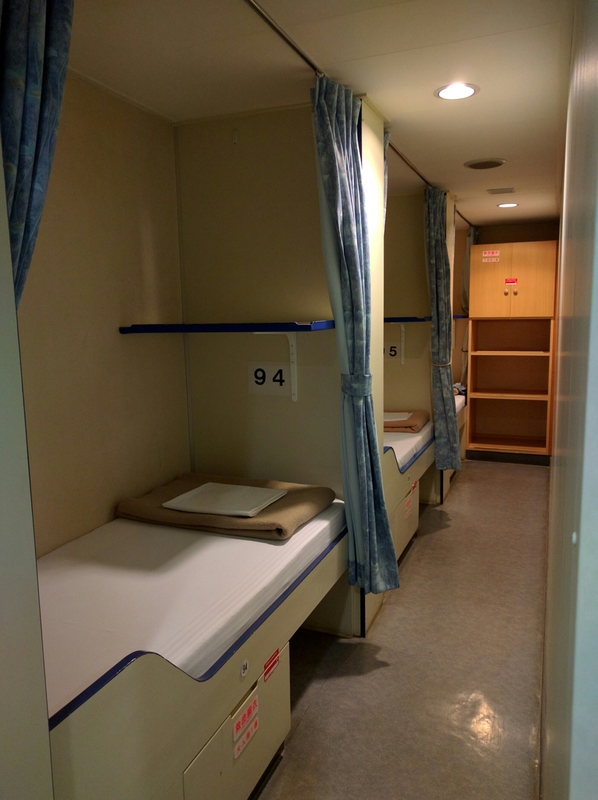 Getting into port, we drove an hour toward Narita and found a michi no ekki for the night. 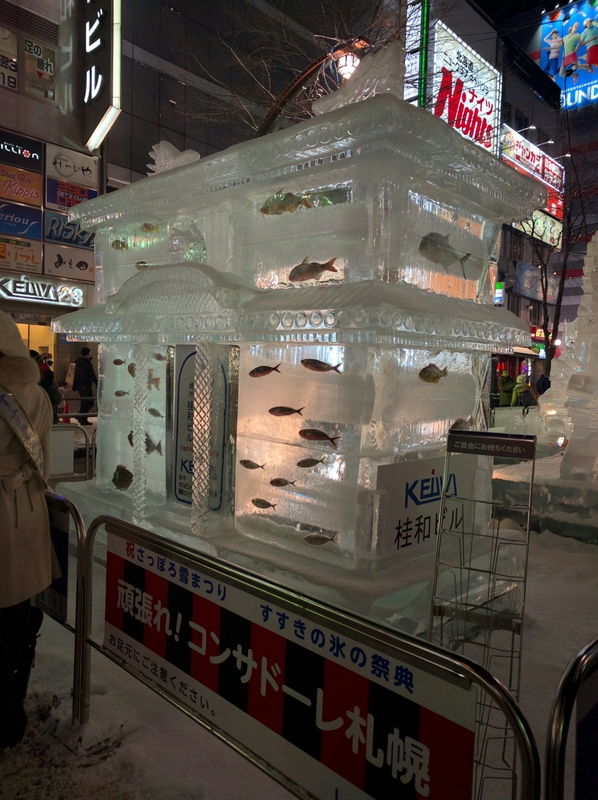 Rob and I did Sapporo as a park and ride from the Chitose Salmon Aquarium michi no ekki (super nice bathrooms and a Lawson). It was a 12 minute walk from there to the Chitose JR station. Using public transit was key because today we were going beer tasting. Each place asks you if you drove when you arrive and will give you the big “don’t serve me beer, I’m the driver” stickers. At the Kirin welcome center. All props provided. Our first stop was Kirin, one stop up the line. Since we had made reservations, they were expecting us. The Kirin tour was one of the best big beer company tours we’ve been on. All the videos had English subtitles and our guide made an effort to explain in what English she knew. 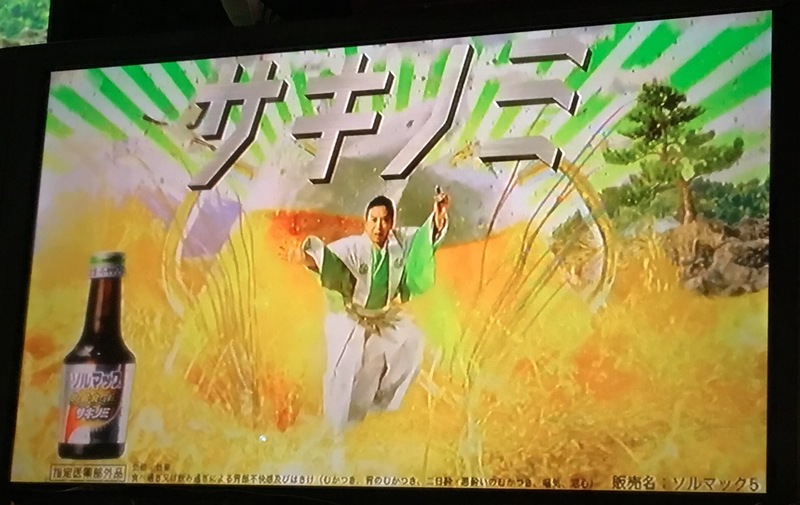 The thing Kirin prides itself on is the fact that Kirin Ichiban (first) only uses the first press of the mash and not the “second press” where boiling water is used to retrieve more sugars from the mash. They have you taste samples from each press so you can witness the very clear differences between the two. For the tasting, we each got to choose two beers to try in addition to Kirin’s special Hokkaido only beer. While drinking, or guide gave us the first of many beer pouring demos that we would see over the next two days. 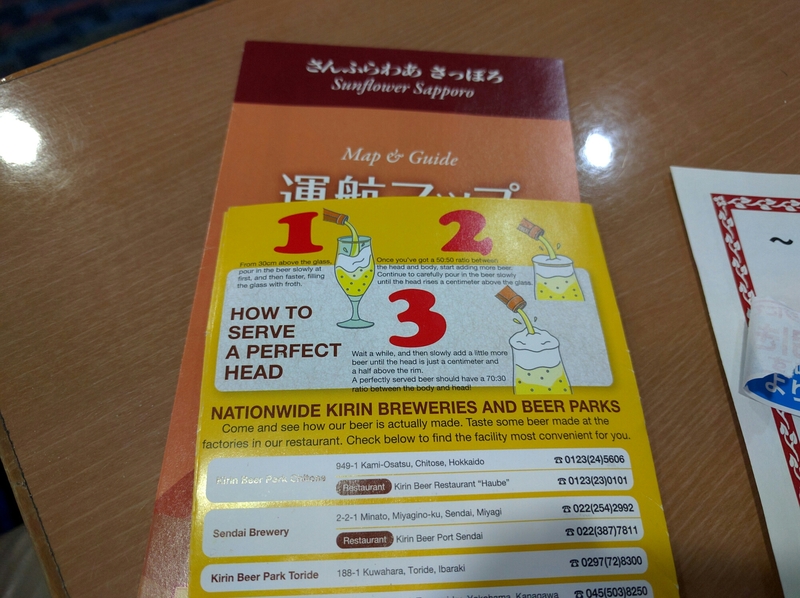 How to serve the perfect head by Kirin. Later, we learned from an American couple living in Japan who we meet at the Sapporo tour that the Japanese are obsessed with head in their beer. This explained the rather weak, foamy pour we received at Otaru brewing that had us both staring at the mug in such disbelief that the waitress took it back immediately and added a bit more. The Kirin tour was a fun 1.5 hours. Near the Osatsu stop (about a 10 min walk from the station), it’s not too hard to get to by JR or there’s plenty of parking. Reserve your free tour three days in advance on their website. No tours on Mondays. The next stop on JR is Sapporo Teinen, home of Sapporo’s Hokkaido Brewery. We headed there next. The walking time was about the same as the train so we decided to save the fare and burn a few calories. The Nissin Cup Noodle Factory in Chitose area. 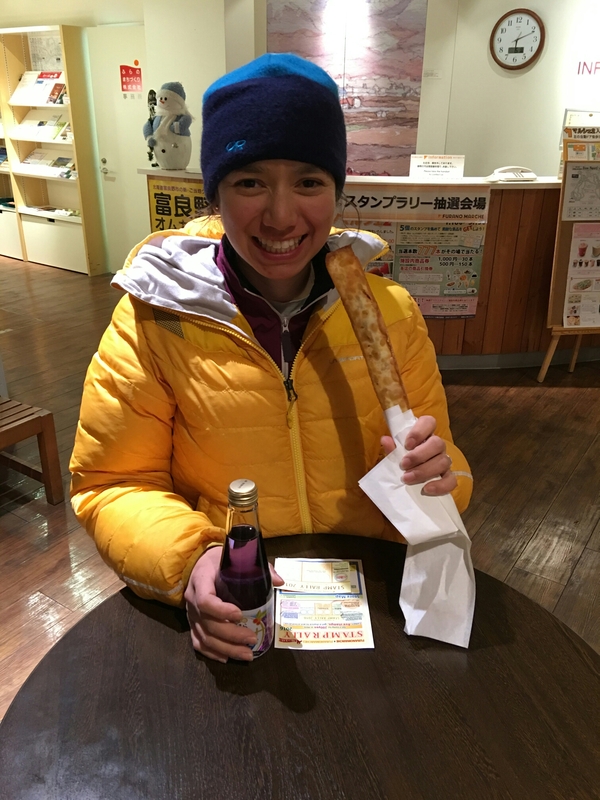 The Sapporo Hokkaido Brewery tour requires a phone reservation by 5pm the day before (info). We tried to call but we somehow got redirected to the museum (in Sapporo proper) and were unable to make the reservation. When we told them we tried to call, they let us on the next tour. The only accommodation for English speakers is a set of laminated PowerPoint slides to follow along the tour. We really enjoyed talking with the other American couple, but the tour was meh and you only got two beers (and some tasty crackers). A bunch of the other folks on the tour were trying the alcohol free beer. 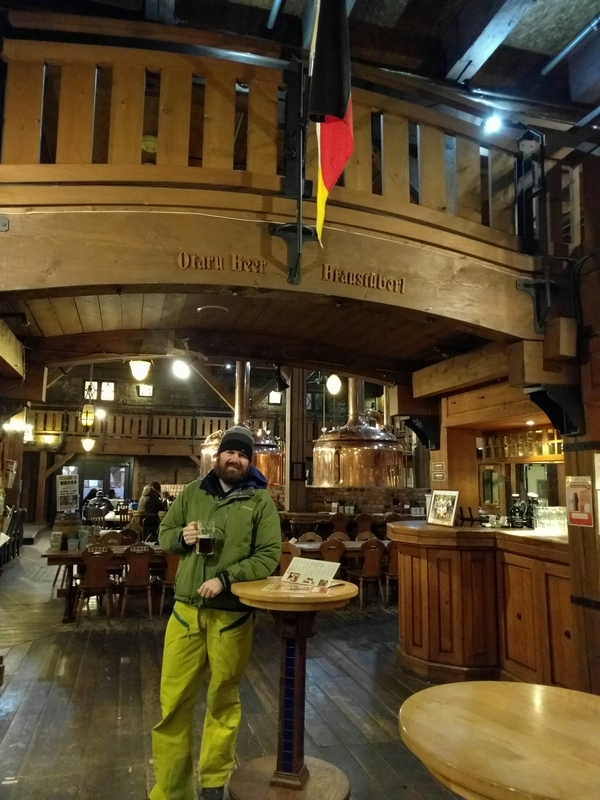 If you don’t want to make the trek out to the brewery, Sapporo turned the historic in town brewery into a museum with lots of English, samples for 200 yen (or the flight for 500) and a couple restaurants. After our two rounds of brewery tours, we took the train to Sapporo, transferring to the metro at Shin Sapporo. The day pass is only 520 yen on weekends (830 yen on weekdays) which was a great value since our necessary rides were going to be around 300 each way. 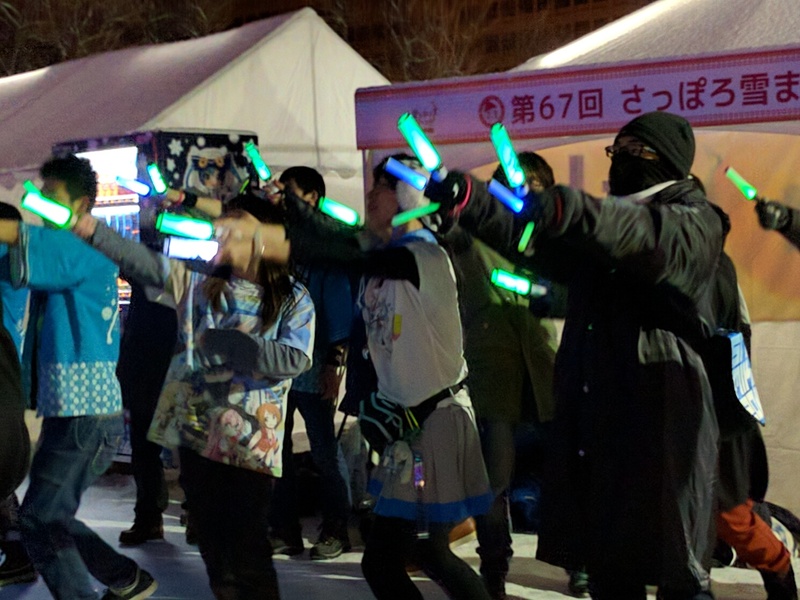 The metro took us right to Odori Park, the heart of the Sapporo snow festival. 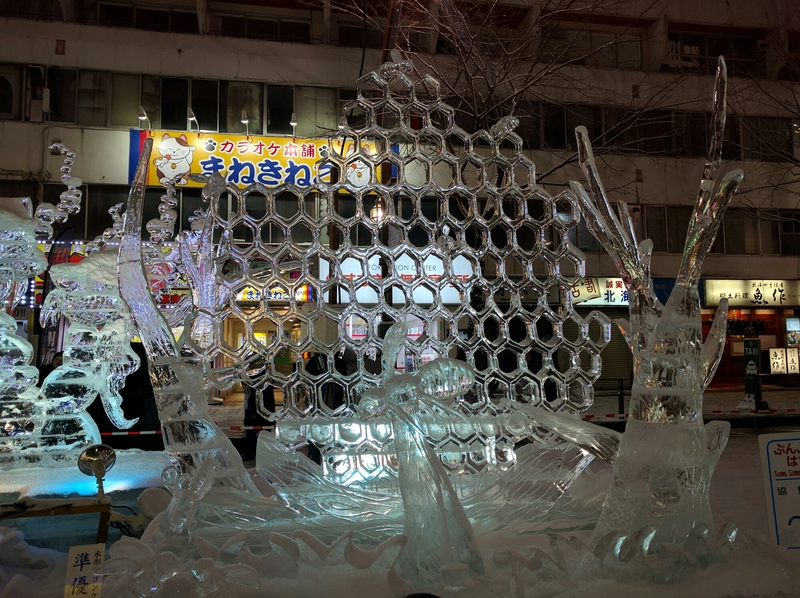 Ice sculptures at Odori Park. I really like the squid. Check out the guy clearing off snow from the sculptures. Rob and I took advantage of a buy food and get a Suntory all malt for 100 yen. 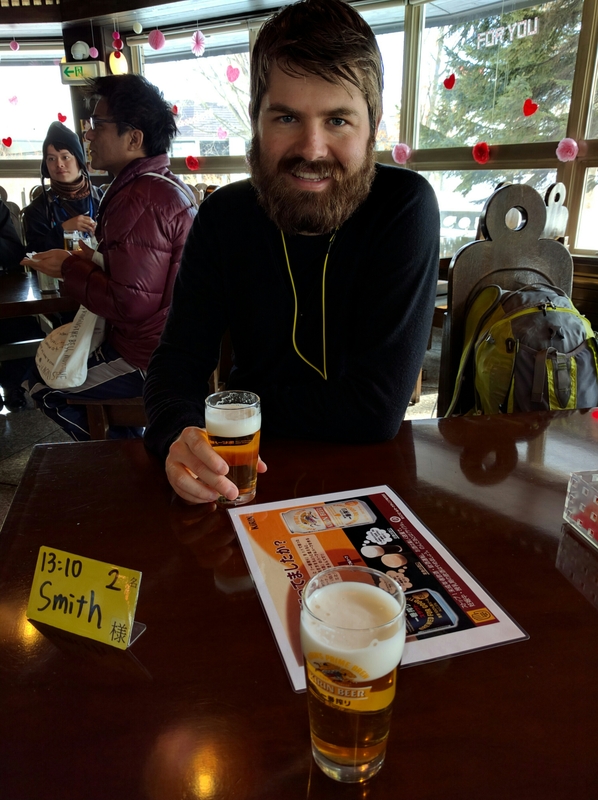 We later learned that all malt beers (like Sapporo gold) are so cheap because they’re taxed at a different rate than normal beer. 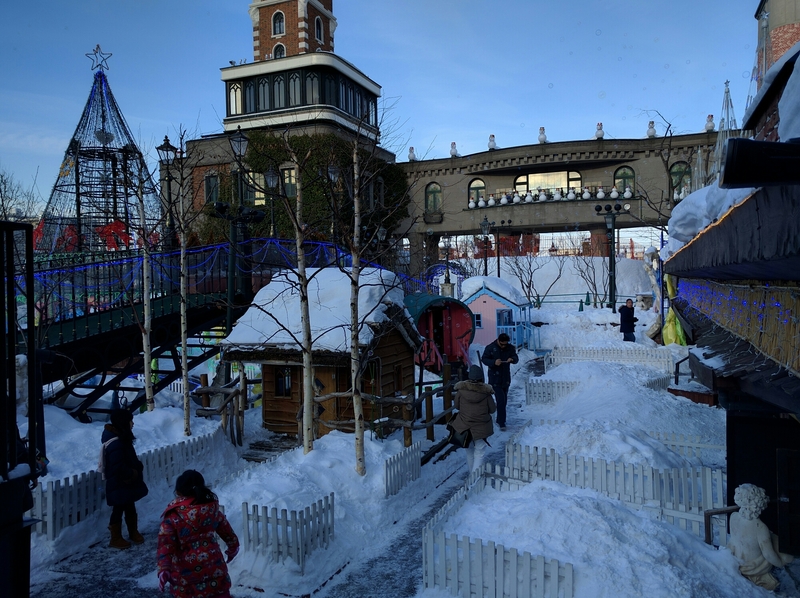 The Park Air area of Odori Park featured snowboard and ski demos. The ski demos required completing a set of moguls before you hit the jump. The Japanese skiers seem to love moguls. Shakespeare’s The Winter’s Tale (not in English) on a snow stage. The Aussie entry into the international snow sculpture contest. I appreciate the humor, although Rob and I agree that Macao blew the other entrants out of the water with its dragon. 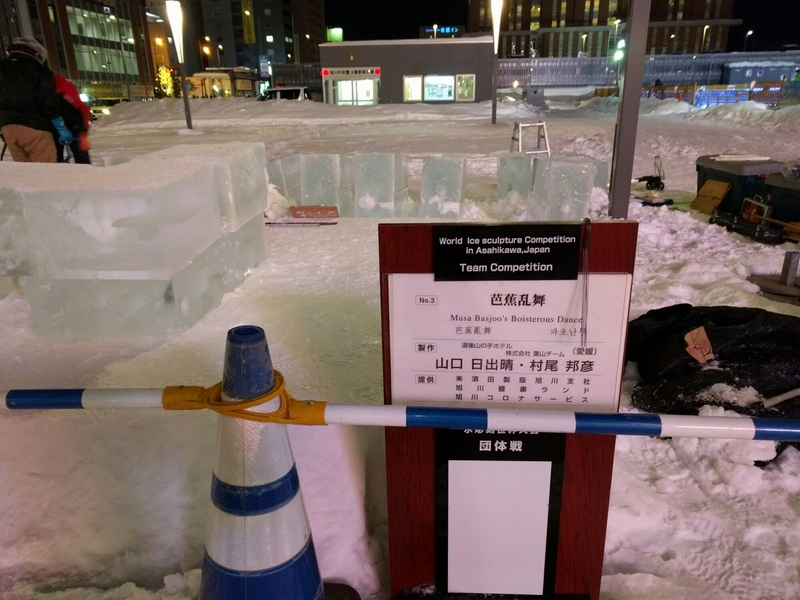 After finishing with the Odori Park area, we continued to the Susukino section, which has a number of ice bars in addition to many ice sculptures. Most of the sculptures are sponsored by companies. We had a drink at the Jim Bean ice bar with a group of Singaporeans teaching English in Tokyo. It was fun hearing their Japan experiences. One of them had been to an owl cafe and told us about the owls she got to hold. To warm up for a bit, we wandered into this 6 floor entertainment complex. The first two floors are an array of claw games. Unlike in the US, where a number of prizes are jumbled in the machine, in most only one prize is available. It looks tantalizingly close to falling in the slot, but really the two arms hold it in place so it takes many tries to slowly pretty it loose. 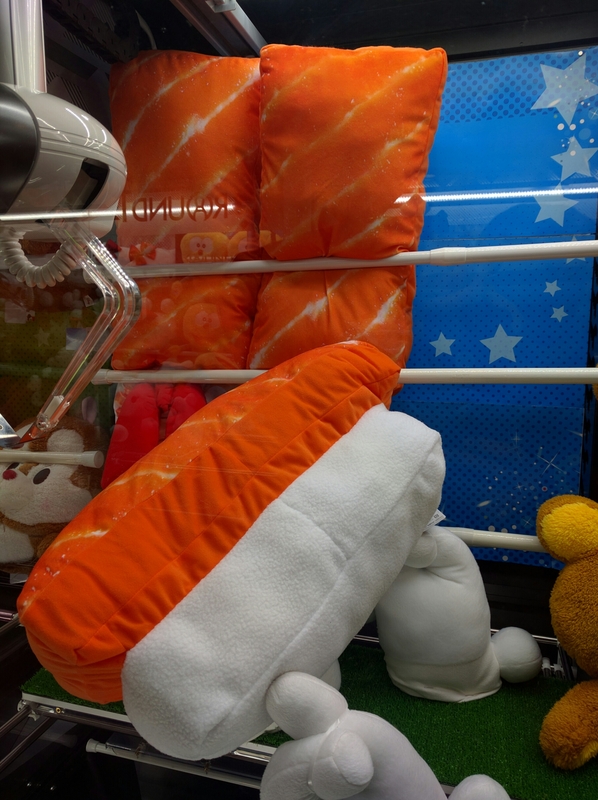 We watched one women feed a machine dozens of 100 yen coins to get this stuffed animal. I’m not sure if she ever succeeded as we gave up watching after some time. 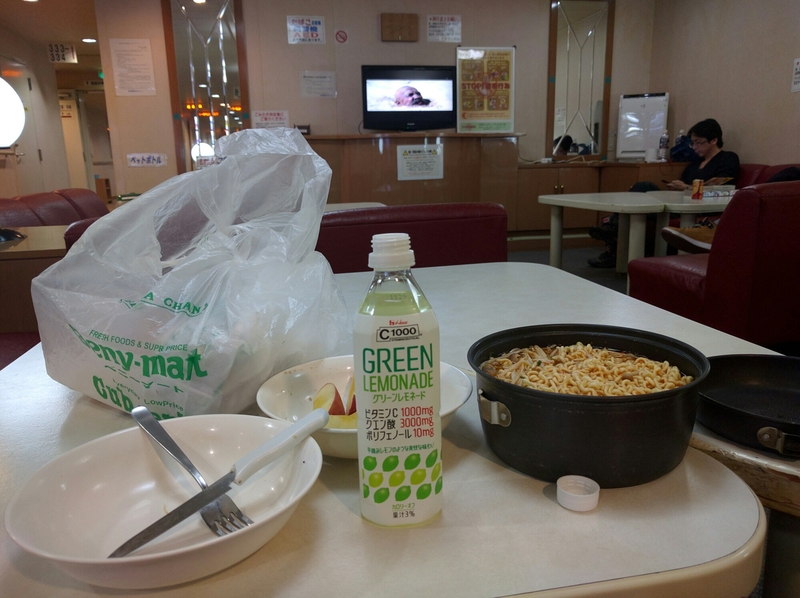 The next day, Rob got up early and took the train into Sapporo to watch the Super Bowl. 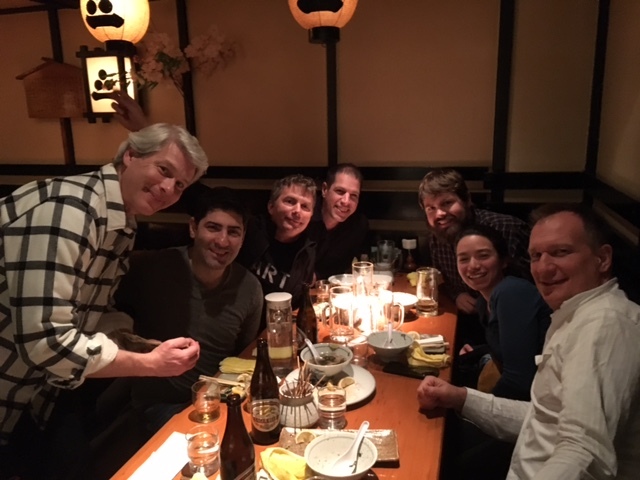 He had a great time hanging out with a bunch of Americans, mainly Navy types stationed in Japan. 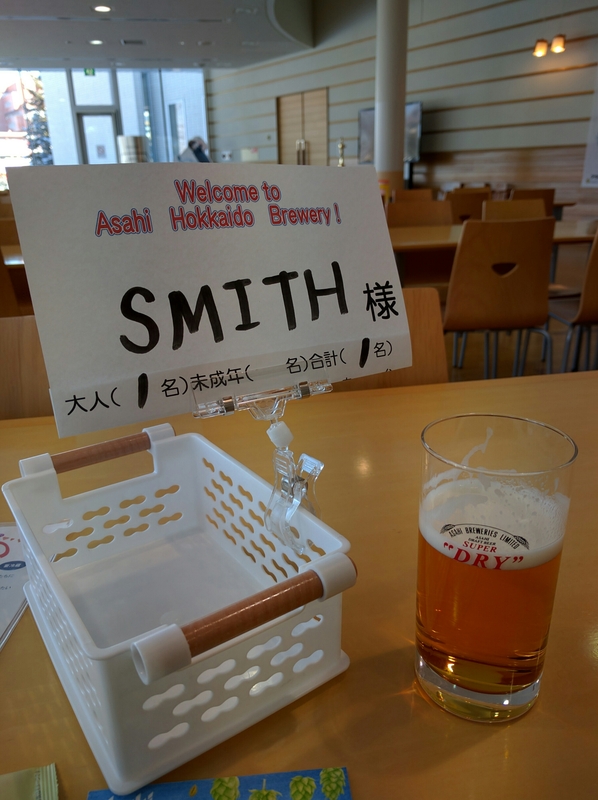 I slept in for a bit, blogged then headed to town for the Asahi beer tour that I had arranged for us (and had already rescheduled once). 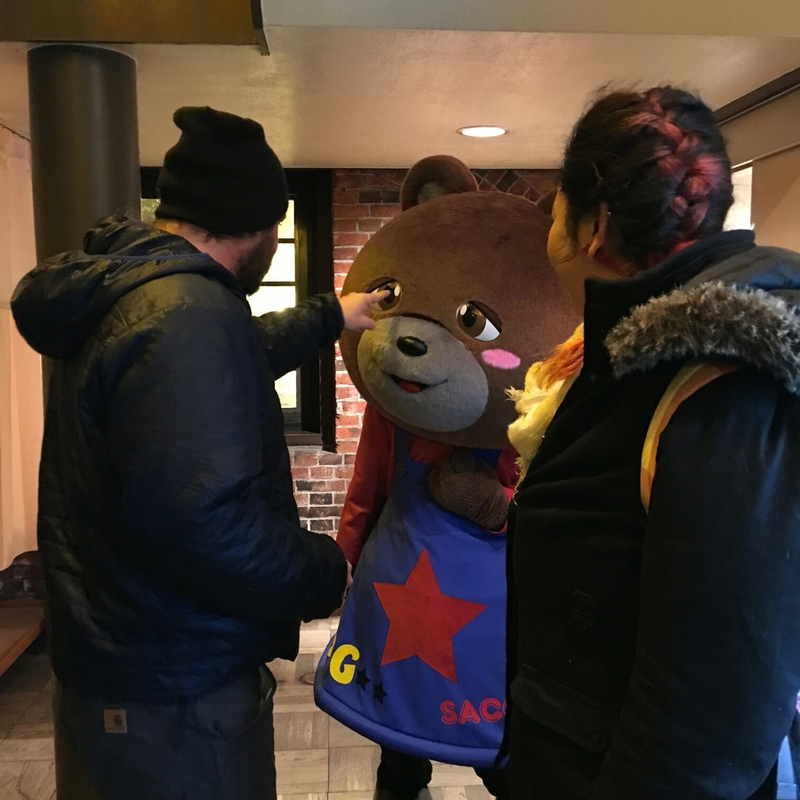 The Asahi tour makes accommodation for English speakers by using an audioguide that you play sections of throughout the tour. It was on par with Kirin, so if you don’t feel like the trek out of town, this is a good one to do and it’s easy to make online reservations for the Japanese tour (here, use google translate and an online english to japanese/katakana/hiragan converter to fill in the blanks). They do request you call for an English guide. 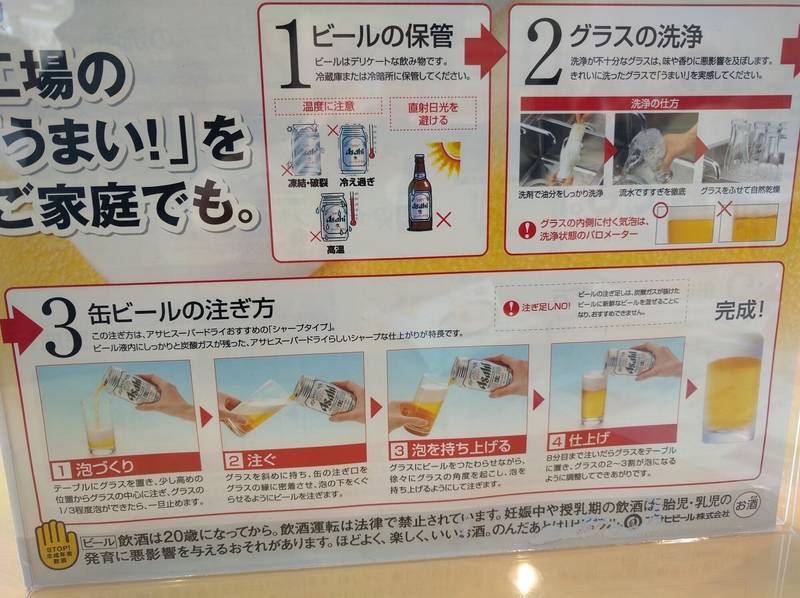 Asahi does amazing sorting of all their waste. In the factory, they have over 50 waste streams, which allows them to reuse and recycle as mush as possible. These bins show the waste streams generated from the tasting. Everything has a place. After Asahi, I went to check out the Shiroi Kobito factory, which made the 20 factories to visit in Japan list. Unfortunately the bus loads of tourist pulling in and being short on time made me leery of paying 600 yen for a tour when I really just wanted to try their product. So, I bought a box of their famous connection, white chocolate sandwiched between two thin buttery cookies and continued to my next stop, the historic government building near Sapporo station. 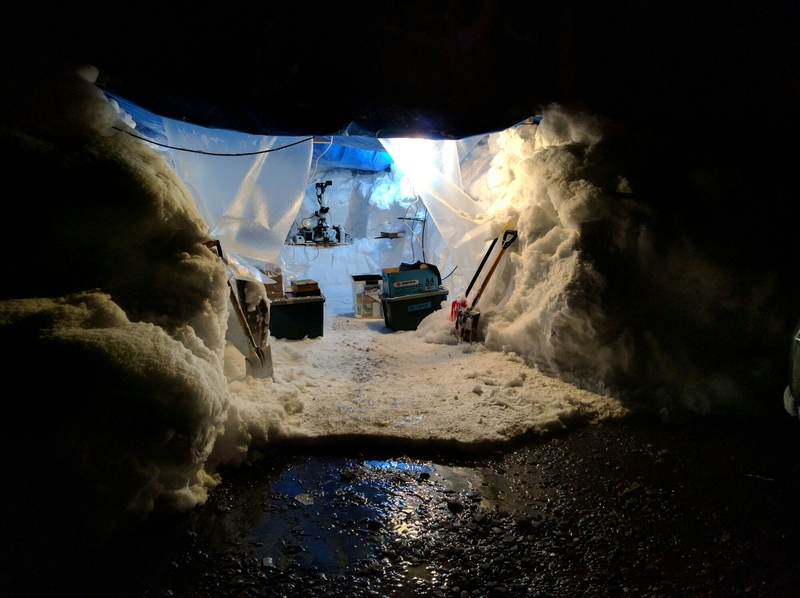 On my walk to the government building, I stumbled into an art exhibits displayed in a series of snow caves/igloos and tourist office folks handing out free hot milk and kelp tea. 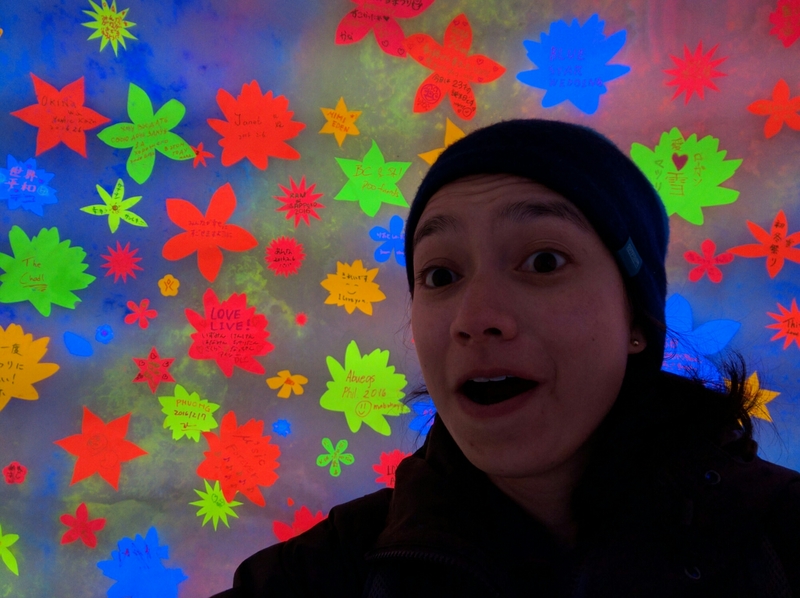 The black light snow cave. Finally, I arrived at the historic government building designed in the American style. 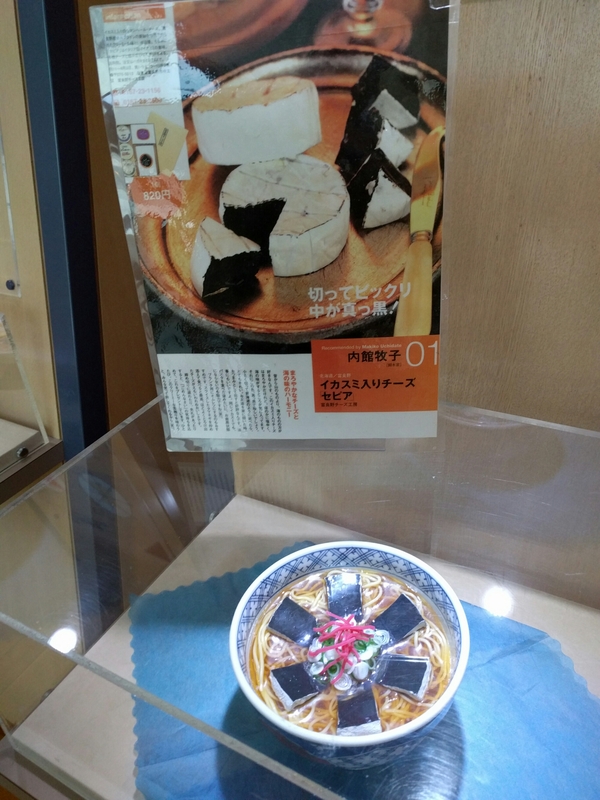 It houses a museum of Hokkaido history, an exhibit of local products and a room dedicated to explaining the North territories dispute with Russia, which I briefly saw mention of elsewhere and was interested to know more. Russia apparently took over some of Japan’s historical holdings at the end of WWII (beyond what was in the treaty that Japan signed but Russia did not) and will not return them. They just keep making agreements to work toward a resolution. 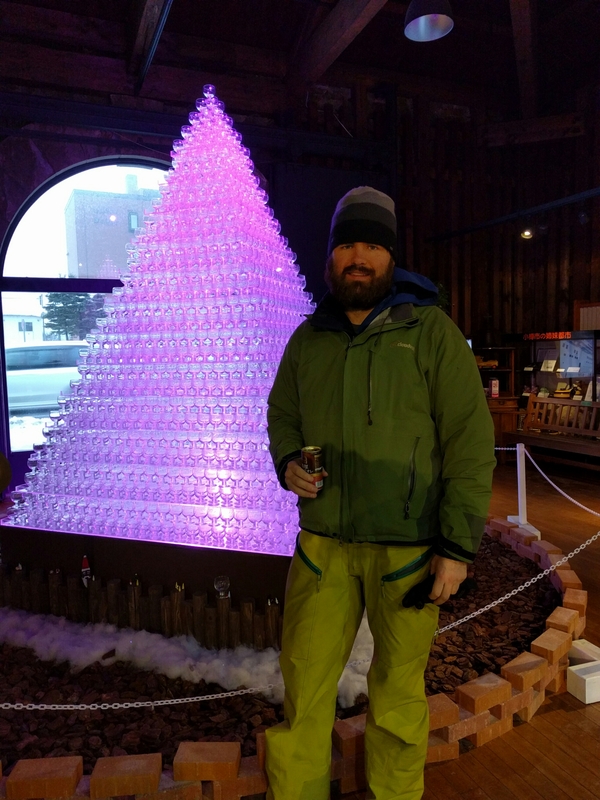 By the time I finished there, Rob was ready to meet up and we convened at the Sapporo Beer Museum. The historic Sapporo Brewery, now a museum, biergarten, restaurant complex and more. Rob, Will (from Vermont) who he’d been hanging out with since the Super bowl, and 2 Aussies (Amy and Amanda) who they met at the pouring demo upstairs in the museum. 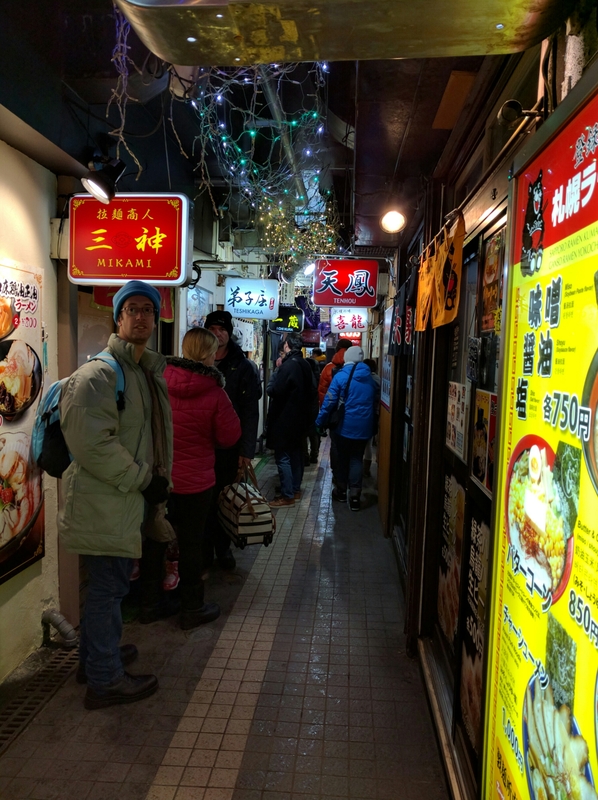 After leaving everyone to their night of drinking, we headed to the ramen alley near Susukino for a quick dinner before the ferry. Finally, some of the famous Sapporo miso ramen. We wandered in one with seats available. 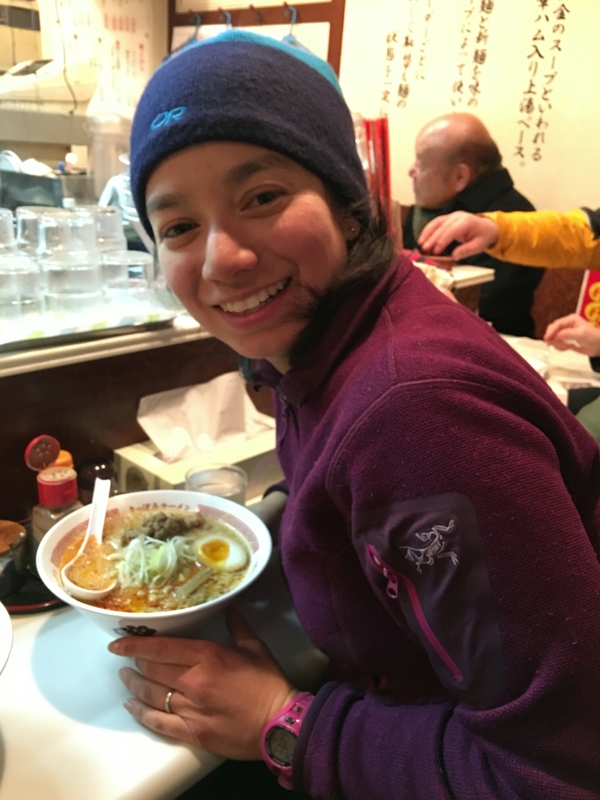 I enjoyed the spicy miso ramen and Rob ordered the delicious miso ramen (a touch of soy sauce flavor). Both were so good! Restaurant ramen bears so little resemblance to the package stuff. Running late, we grabbed the train south to pick up the car and catch our ferry back to Oarai in Tokyo. 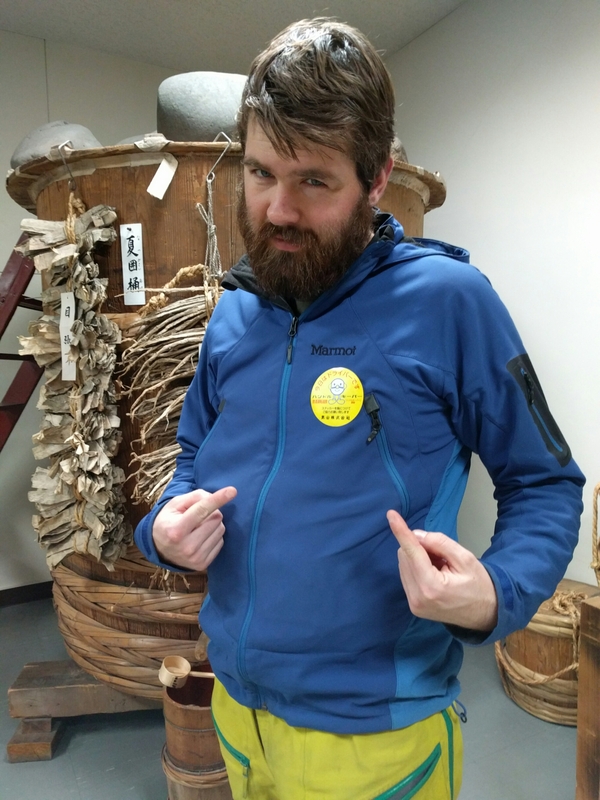 Rob and I rushed to get to Asahikawa in time to visit the old, famous sake museum and brewery. We got there is with about 3 minutes to spare, which meant all the bus tours were leaving. 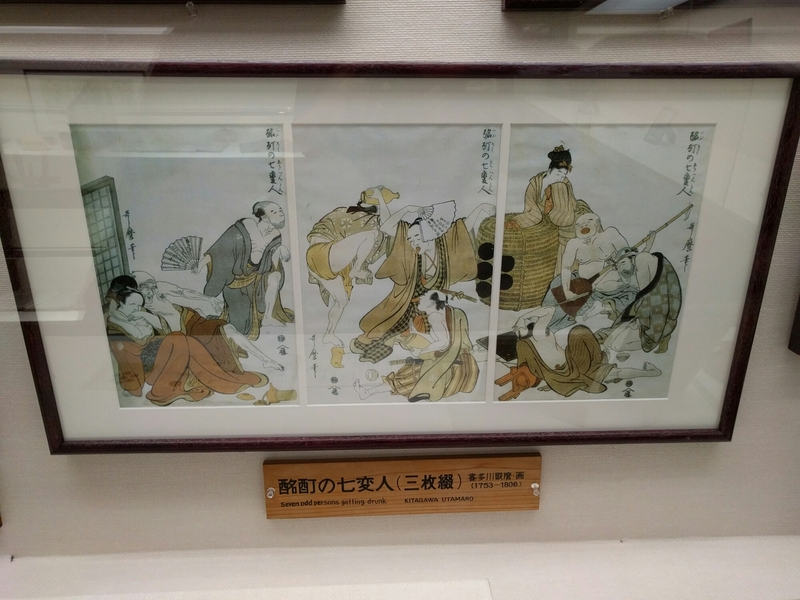 In addition to the factory and brewing equipment, the museum had a collection of ukiyo, woodblock prints, featuring the brewery. I liked the one above, if for nothing but the title. I really liked their dry sake but it was 5400 yen for the bottle. Yikes! Next, we headed for one of the two in town michi no ekki. The one was stayed at was about 1.1 km from the train station where the ice sculpture walk begins. After exploring the michi no ekki (there was a car show going on) and cooking dinner, we headed that direction. The train station, a shiny new edifice, is connected to a mall with fancy food court. We browsed our way through to warm up before braving the cold once again (~ -6 deg C) to view the sculptures. 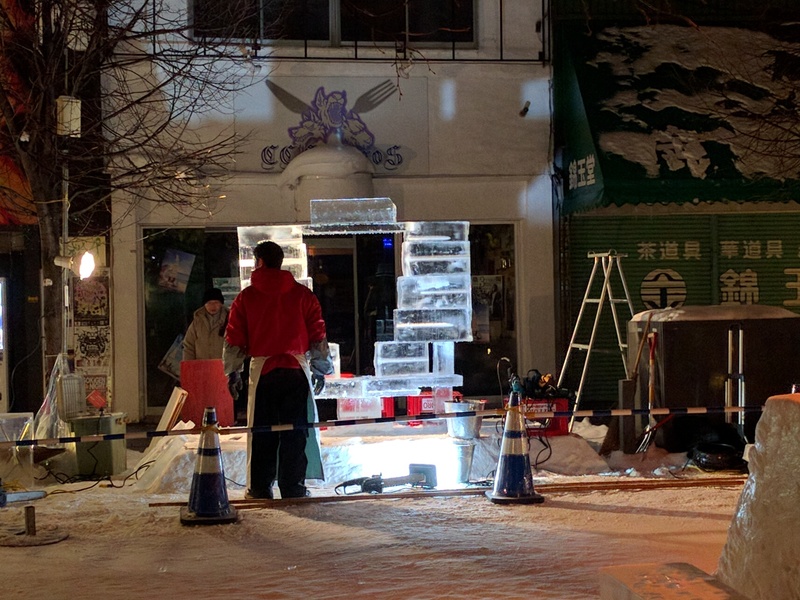 Clearly, the contest had just begun because of everyone was in the process of stacking their ice blocks into a general form. It was neat to see all the different tools of the trade: metal plates in hot water baths, water squirt bottles, hand planes, scoring devices and flat stick saws. The sculptures nearest the station were team projects where as we walked northward, the individual competition took over. 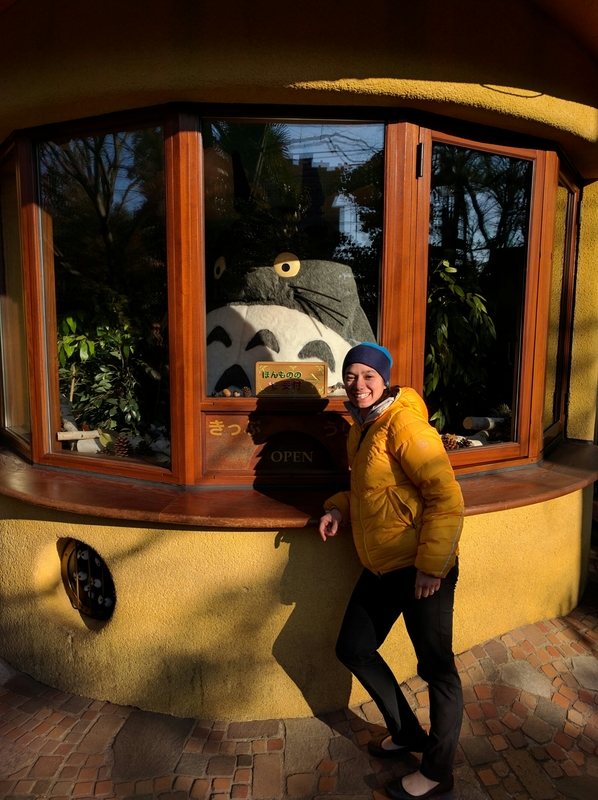 With the help of the amazingly helpful tourist info lady and her husband, John, who runs the backcountry store in Furano, I planned this awesome day of touring. From the parking lot, you cross a creek (not frozen, snow bridges for part), skirt one ridge then climb up the second ridge. According to John, the avalanche forecast was low (zero, he joked) (disclaimer: you should use your own skills and judgement to determine whether conditions are safe). The whole area is a set of ridges running north/northwest. The top can be windy and there are wind deposits. Trees are dense for awhile but become widely spaced as you get toward the top. We never made it to true alpine on either of our two laps. This area isn’t a secret. I had purchased the last of 40 topos from the backcountry store (There’s a website that has the topo data free). We ran into a group of 6 women, a group of Italians and a couple from bothell that had the same skis as us (crazy, right?). We didn’t make it beyond the second ridge so if you do, you’ll find it much quieter. 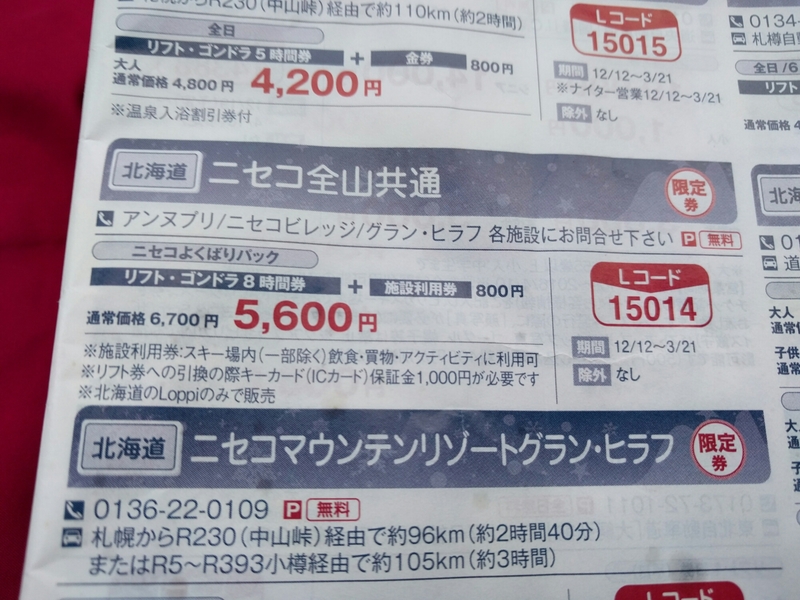 We also learned there’s a public bus three times a day that can give you some extra very for ~200 yen or Toyota touring is possible (not sure if this is exactly the same slope but it’s not far). The best part about this location is all the hot springs. 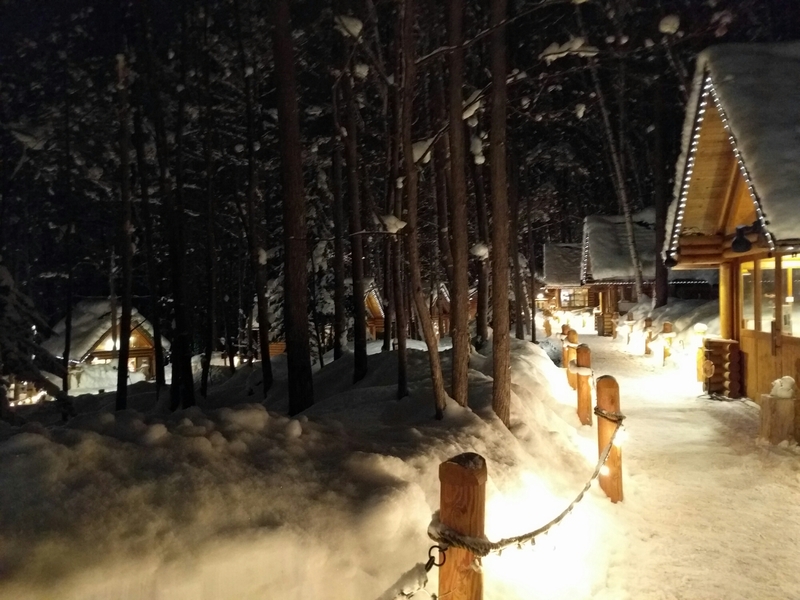 There’s a free “natural” Hot spring, the Fukiage Spa, (the pools have been built up and railings and such added) about 2 km from the parking lot for the skiing. Also nearby is a nice hot springs lodge with an onsen facility and nice kitchen. In the outdoor hot spring, we met a couple from Bar Harbor, Maine, who were staying there. 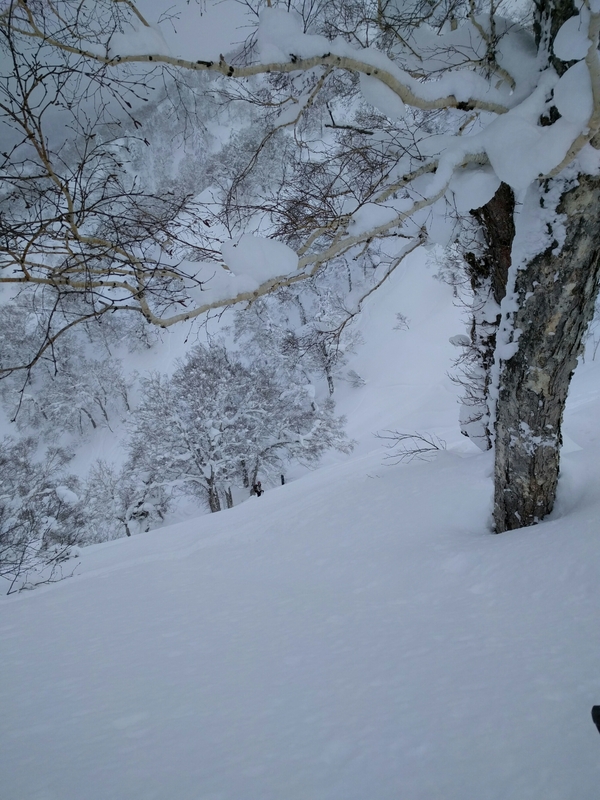 They had spent last winter skiing Myoko Kogen for the season and raved about it. Apparently, there a reasonably priced season pass that covers the ski grounds. 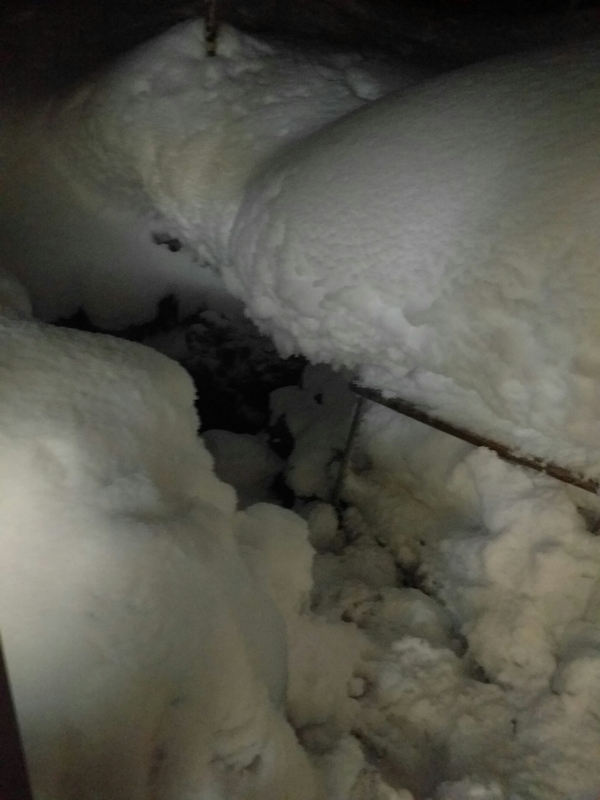 This year, snow conditions made them go to Hokkaido instead. We had fun chatting with them in the hot spring for awhile. The second pool had a Japanese family with kids and everyone in bathing suits, so we avoided it. They had brought their own pop up dressing room tent. 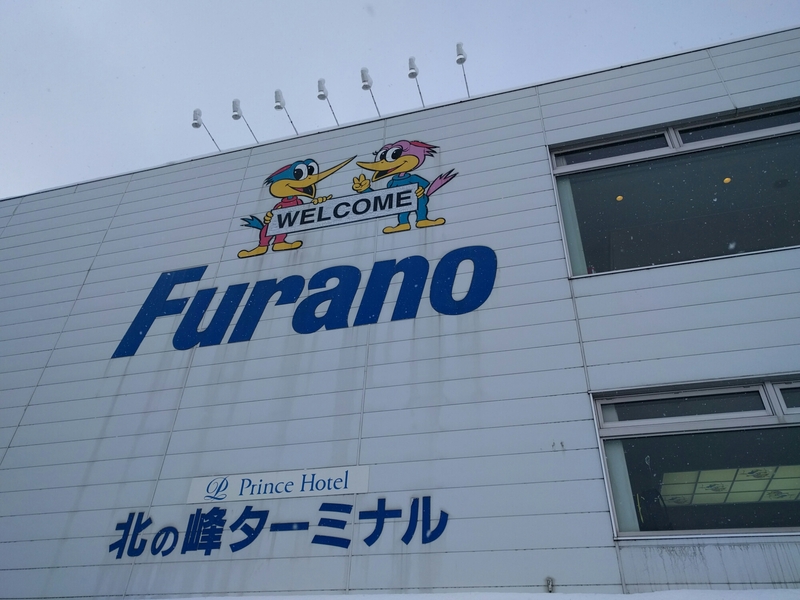 We rounded out the evening in Furano eating out of the local food market and the 7-11, where we parked overnight. We tried a long spring roll stuffed with tomato and corn, namara-bo, served with a local soda, then some on sale strawberries and tofu. Super long spring roll. Yum! 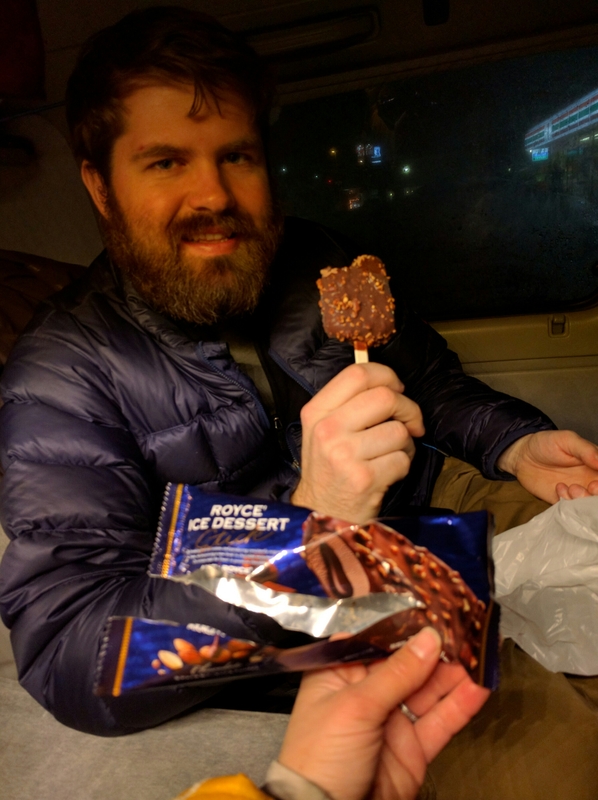 Rob found a new favorite ice cream bar. Royce ice cream bars. 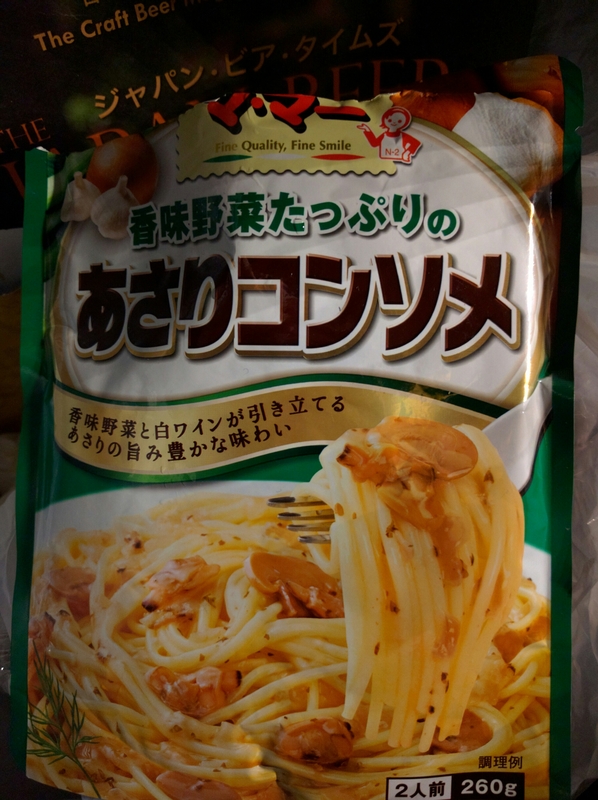 Super tasty, but not available on Honshu as far as we found. The one problem with parking overnight is that the plow drivers inevitably comes in the middle of the night and makes a huge racket. This is as much an issue in the free lots. Early one morning, the plow driver at a michi no ekki woke us up to have us move the car. At least this dude just plowed around us. With good weather forecasted, we bought day tickets for the ropeway. Since it only runs every 20 mins, the four hour ticket is more of a gamble if you have bad timing. Most of the time, paper tickets allow you to stretch your mountain time by staying high and riding chairs those shorter chairs that don’t check passes. Here they definitely check every run since there’s only the one ropeway. The day pass also allowed us to break for a hot lunch. Such luxury! The morning visibility wasn’t great so we did a couple runs skiers left of the ropeway but inside the loop of groomers. It was already tracked up in places and once you got to the groomer speed was vital to avoiding a long pole pull at the end. We tried a third run staying more central and that was better. On the way to the car for lunch, I spotted a great deal – visitor survey in exchange for free onsen ticket. Two please! Then, we cooked the best meal of the campervan food series, a yakisoba with tons of veggies and this wonderful thinly sliced pork marinated in delicious sauce. Our car smelled so good when we came back at the end of the day. We managed to ski three more runs after lunch. Visibility has improved so we had a better idea of the terrain. Going right of the ropeway, we found better, less tracked snow, although the trek out took a bit of time. By the last ride up, the lift was nearly deserted except for us, a Japanese couple and a big group of Europeans. They had skinned up and were headed on a short hike. They gave us directions and we followed them to our best run of the day. Poling ourselves out took awhile, but was definitely worth it. We also caught the view with light beams radiating from the clouds. 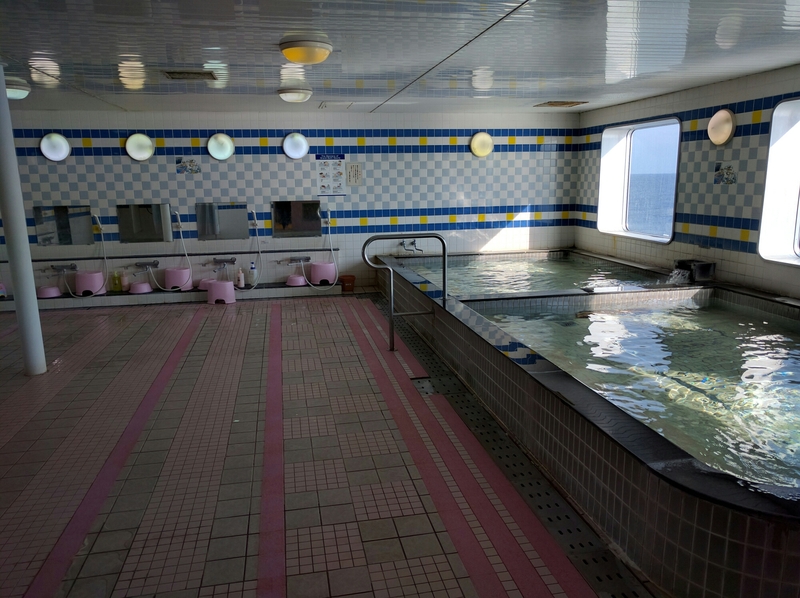 Afterwards, the free onsen felt great. The open-air pool was down a flight of icy, snowy stairs that I gave up on after stubbing a toe on an ice chunk; the indoor pool was still nice though. Yew, that's a pool down there. The women’s side was deserted, however, I could hear Rob and the dudes on the other side of the wall. He met another person from Westlake who graduated in 2006, another small world moment. 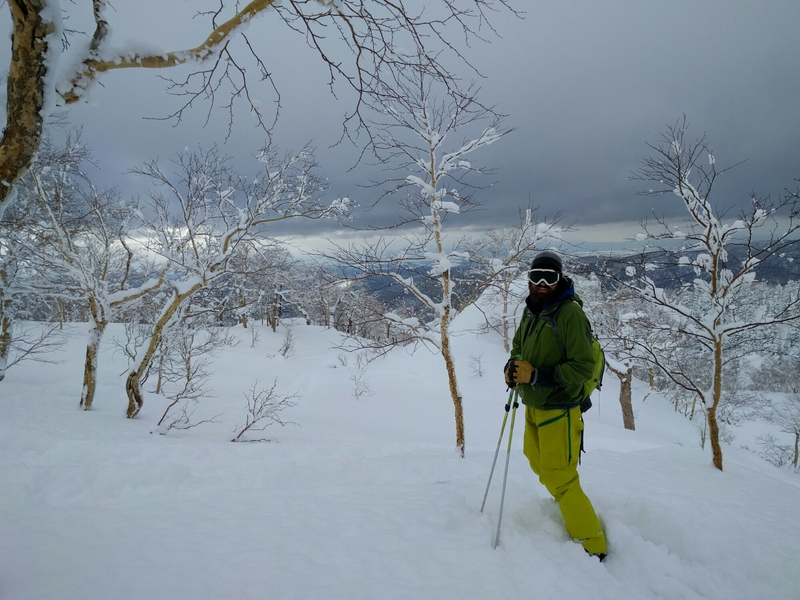 Rob also talked to some one who had done a backcountry tour at Asahidake and said their group had gotten fresh tracks all day. If we went back, a bit of local knowledge and/or topo would go a long way to getting better runs. Also, picking a day with low winds is definitely important. 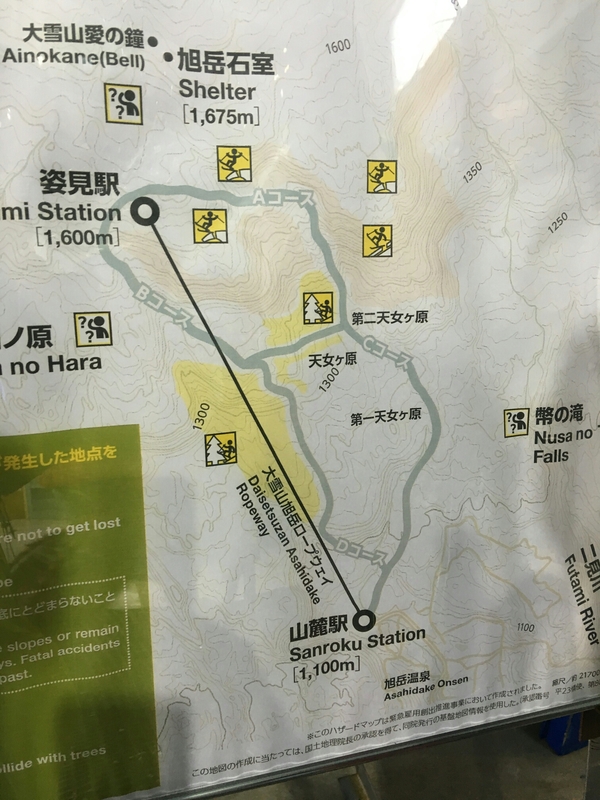 There are plenty of lodging options not far from the ropeway base. We used the onsen in the Daisetsuzan Shirakaba-sō. Dinner that evening back in Biei, we tried out a new pasta sauce. Despite our best efforts, somehow we still ended up with clam sauce. Does this look like clam sauce to you? I thought those were mushrooms. 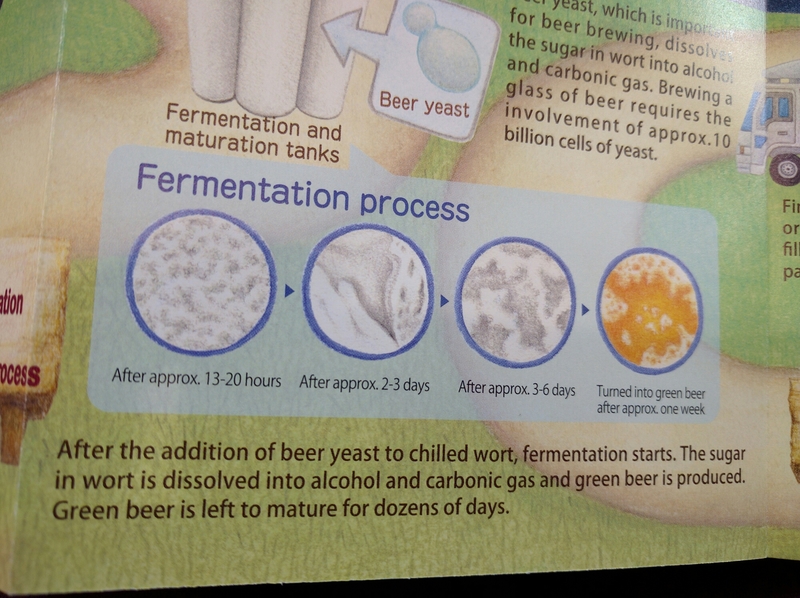 I finally got a chance to browse the Japan craft beer mag from Otaru. 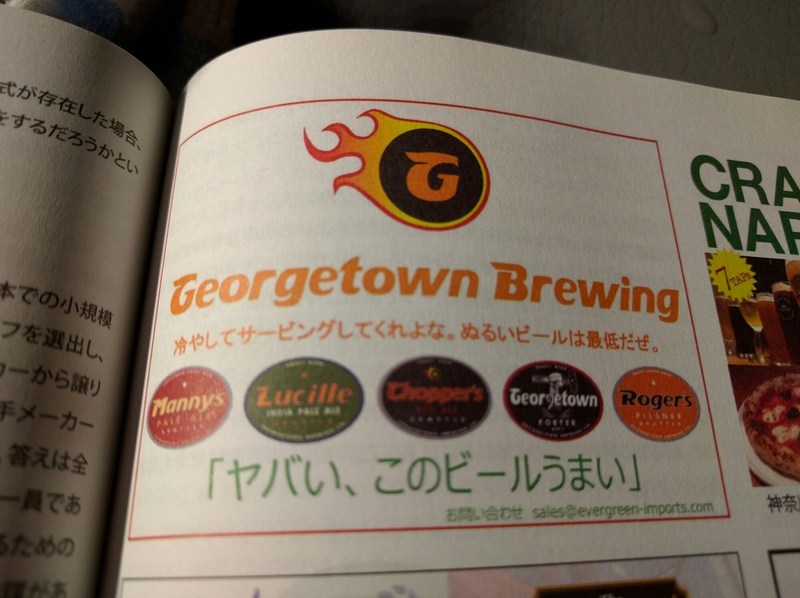 They have an ad for Georgetown brewing. You know that exhausted-ecstatic-ravenous because I skied through lunch and only paused on lifts look powderhounds can get. That was Rob after 6 hours at Furano. I should have taken a picture, but we were rushing off to the cheese factory before it closed. He said he was lapping super deep powder all day with a short hike and that there’s a premium zone, a bowl of powder that opens at 10:30am, which he managed to get to just before the rope dropped. Even though I enjoyed my day of planning and postcard writing, I was a bit powder jealous and we talked about skiing there another day. 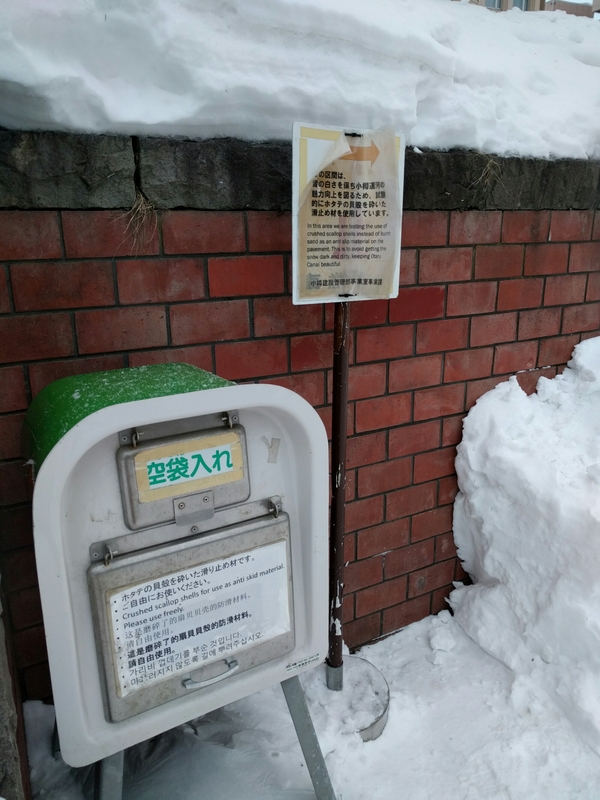 The town area surrounding the ski resort (Kitanomine base) is very cute and has the most important things. My first shop was the backcountry ski store to get a topographic map for a tour in the national park. I bought the last one and got some route info from the store owner. 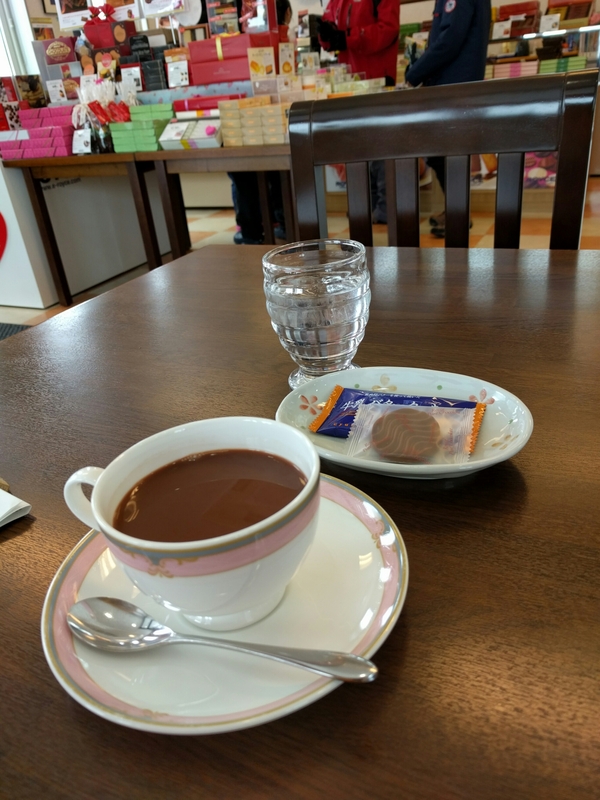 Errand complete, I wandered downhill to the Downhill Royce chocolates to try some hot chocolate and pick up some nama chocolate to surprise Rob. My mom mentioned that she’d heard it was really good chocolate and 3x the cost in the US. Must eat! 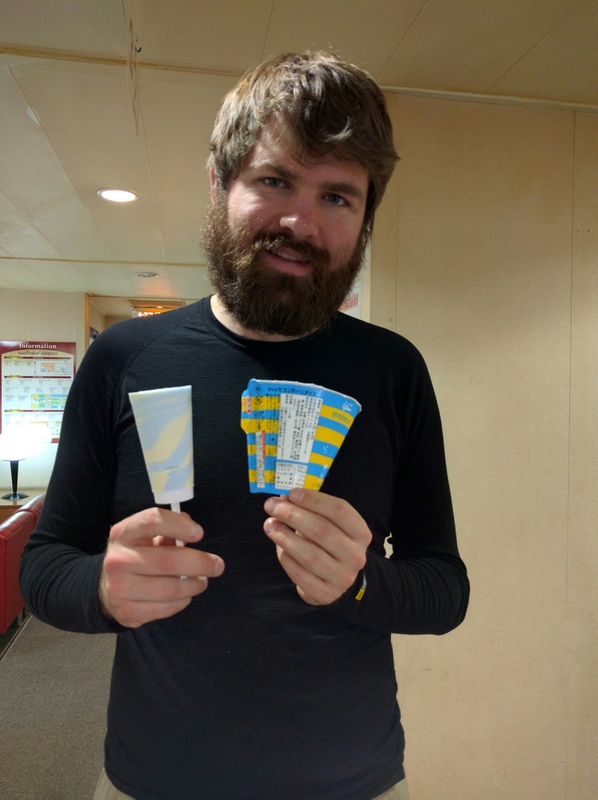 After a bit of van cleaning and reading time, Rob was done skiing and it was time for cheese. 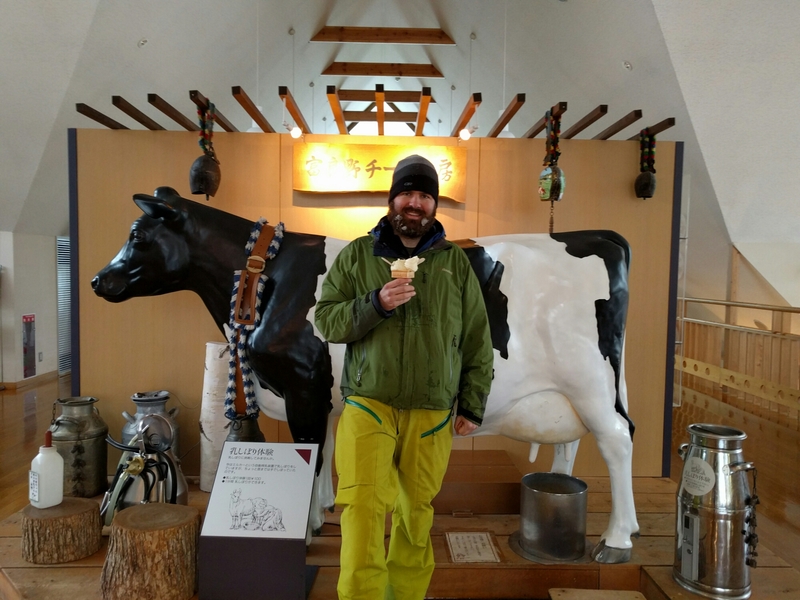 Aprés ski at Furano Cheese Company Factory. After tasting cheeses in the gift shop, we bought their reasonably priced ice cream. It came in a variety of interesting flavors including cheese, milk, corn and tomato. We tried cheese and corn. They were both tasty but very mild flavors. We both hadn’t had lunch so we splurged and ordered a pizza from their pizza factory, which was amazing. They have a legit wood fired oven and the crust has that perfect crisp-chewy balance. Cheese (chizu) ramen is actually a thing here. Those wedges are their squid ink cheese. 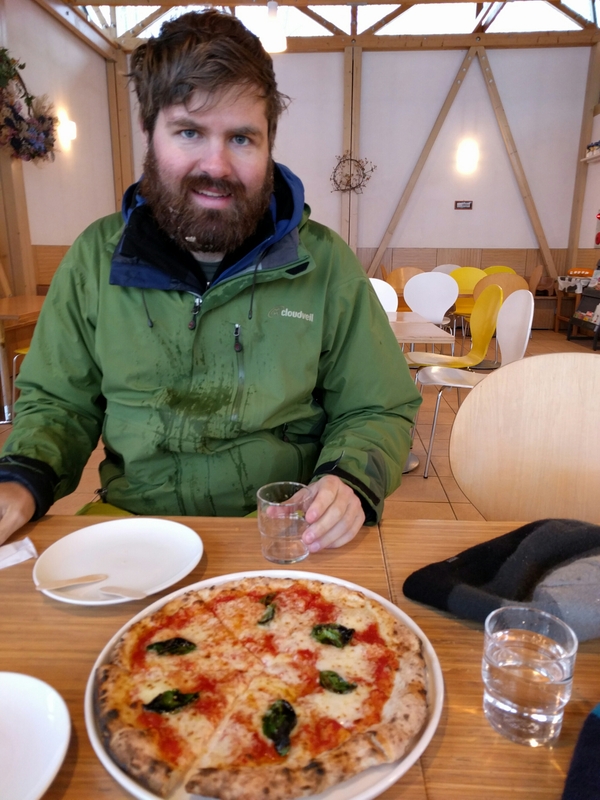 Pizza from the Furano cheese factory. They gave a legit pizza oven. With full bellies (apparently a no-no for onsen bathing), we went back to town for some bathing. Bell Hills was recommended to us as the best, but we ended up at Hotel Naturwald Furano. Their hotel is owl themed with cute owl things everywhere. 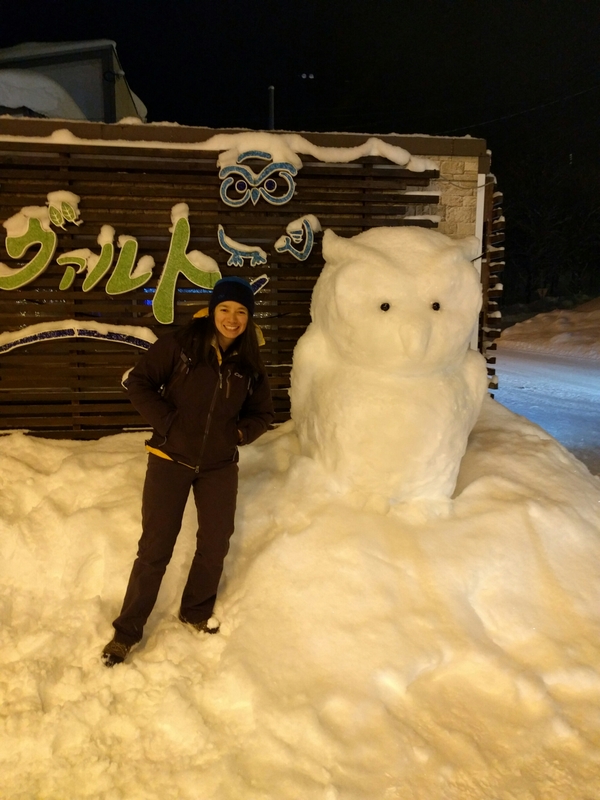 Snow owl outside hotel naturwald. There are more owl pics than these but I won't subject you to anymore. The onsen was nice with tons of different bath products and even a hair straightener to use. Clean and full, the next stop was Ningle Terrace, a cute artisan shopping Village in the woods behind the New Prince Hotel. It was beautiful at night and the craftspeople had some neat works for sale. Rob and I were a bit tempted, however, our favorites were too expensive. 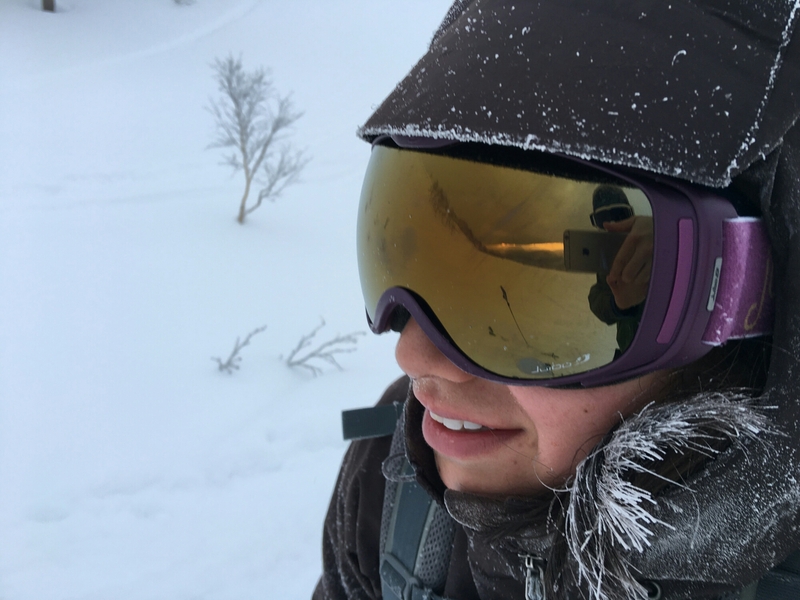 Since the best weather conditions were lining up for the next day, we took the opportunity to head to the Biei Michi no ekki, setting ourselves up for a day at Asahidake. The ropeway can be closed due to high winds so we wanted to explore it while the weather allowed. Ending the evening with the long awaited Royce nama chocolates (bitter). 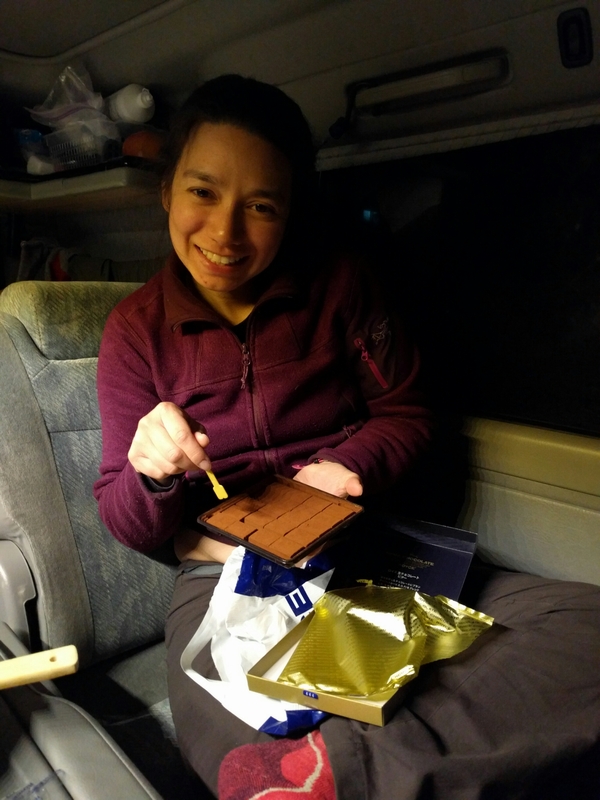 Camping for the night, we broke out the Hibiki 12 year and Royce chocolate. Otaru, the closest city to Kiroro, is located on the nearby coast. Known for its seafood, glass art and canals, we figured it was good for a quick evening stop. Glass showcase in the visitor center. They have crushed Scallop shells for you to spread for traction. Turns out that the canal area is firmly on every tour bus route imaginable because we kept wondering where all these folks came from. 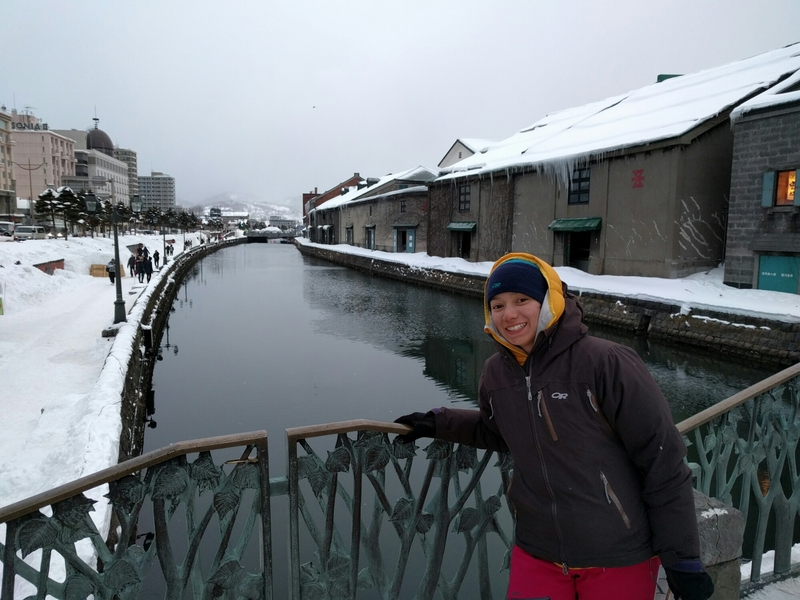 The canal does have a two really picturesque couple blocks for strolling lined with historical warehouses adorned by icicle caps. We checked out one of them, which is now Otaru brewing for a snack. Otaru brewing. Atmosphere>beer taste. They did have very reasonably priced schnapps too. 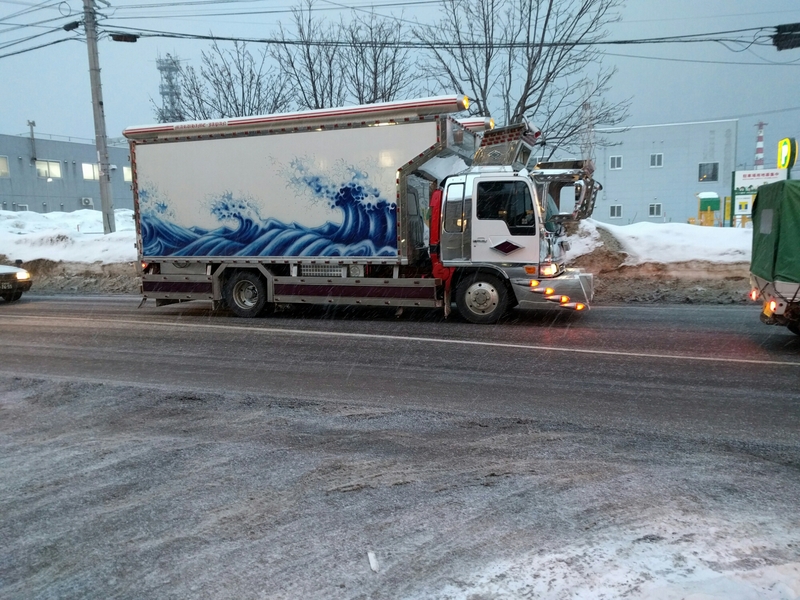 The last highlight of the night was seeing one of the pimped out Japanese trucks. Rob had been talking about them for weeks and this one was the best one we’ve seen. Kiroro Snow World, resort about 60 minutes from Niseko, had a much improved crowd situation. The lift ticket is one of the more expensive ones but the infrastructure is so nice. They have the fancy electronic gates, all bubble chairs and gondolas to help you stay warm. Inside the lodge is a rest room with couches, tables and even a tatami section with good WiFi to hang out in. 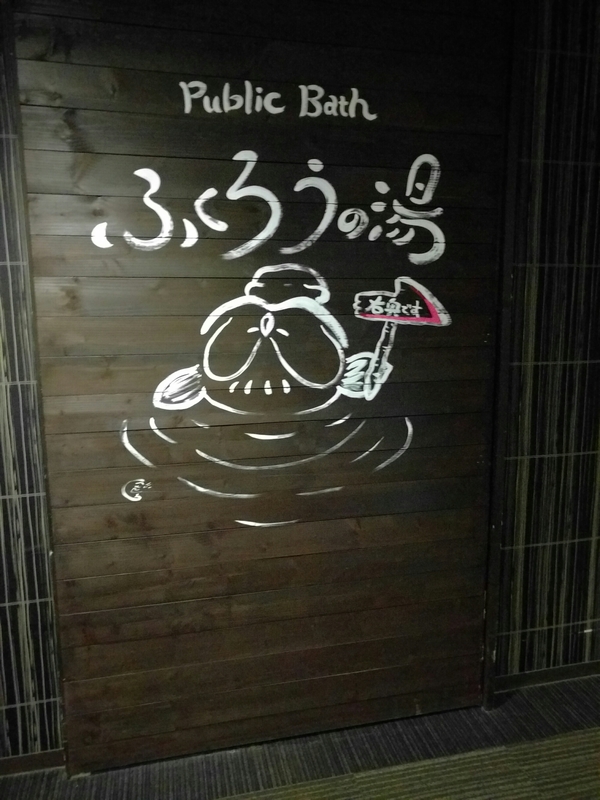 A public onsen is in the same building for your convenience. After 5pm, it’s supposedly hotel guests only, but no one mans the desk to check. Backcountry gates are available, but you need to file a climbing plan with the mountain club at the base center . It took us a few runs in the morning to find the good snow. Following powderhounds advice, we tried the top of the Asari quad lift, but a bunch of it was wind effected. The gondola line turned out to be better and there are bunches of fun trees in bounds and just outside. At the end of the day (our 5 hr pass expired), we did a lap in a backcountry bowl that we had to hike out from to get back. The snow was fabulous! It was so good, we came back for three or laps the next day. There is a michi no ekki not too far from the resort for easy van crashing. Overnight snow freshened things up and the day was mixed sun and flurries. We were able to pay for only 1 ride/2 express lifts then hike the rest. We did three laps on the back bowl area facing north. Snow conditions were super stable. I had a pretty good wipeout on the first run (of course with an audience). Trying to figure out what happened, I think I got a large face shot, freaked out cause I couldn’t see, promptly caught a ski then did a nice tumble into the powder. Luckily, my tether held so we didn’t have to spend 2 hours digging for it like some other folks we met (their whole group was rocking super bright ski laces when we met them). Note to self: must learn to deal with temporary powder blindness, a problem I will hopefully have again. On our last climb out, some snow boarder had come through and wiped out huge sections of the skin track. Not sure why since that's got to be the crummiest line down the hill. We would definitely come back to Kiroro! Good snow, fast lifts and great backcountry terrain accessible. The best ticket deal we could find was the Yokubari pack (slightly discounted ticket with 800 yen toward another purchase). It’s mentioned on the Niseko English site. 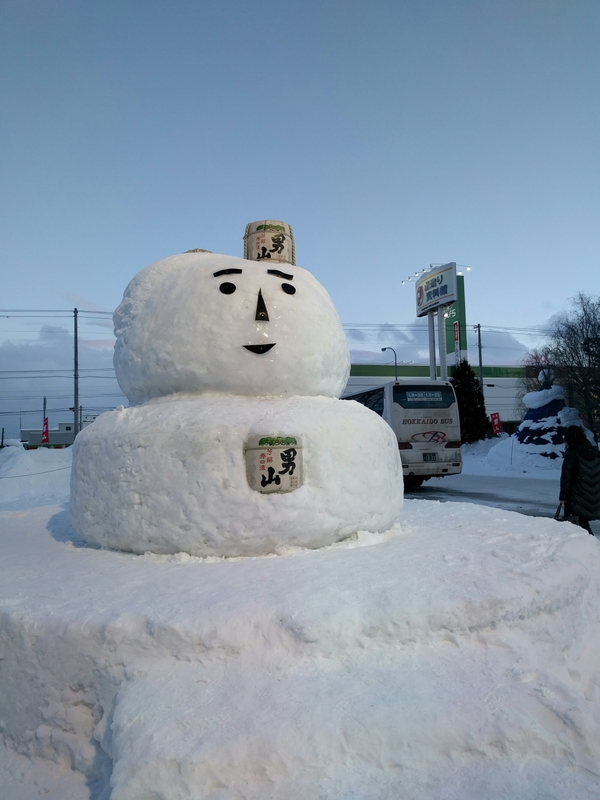 Is only sold at major Hokkaido convenience stores. We bought our at Lawson using the Loppi machine. Here's the Loppi info to buy the Yokubari pack. Everything got skied out quickly (including easy sidecountry). 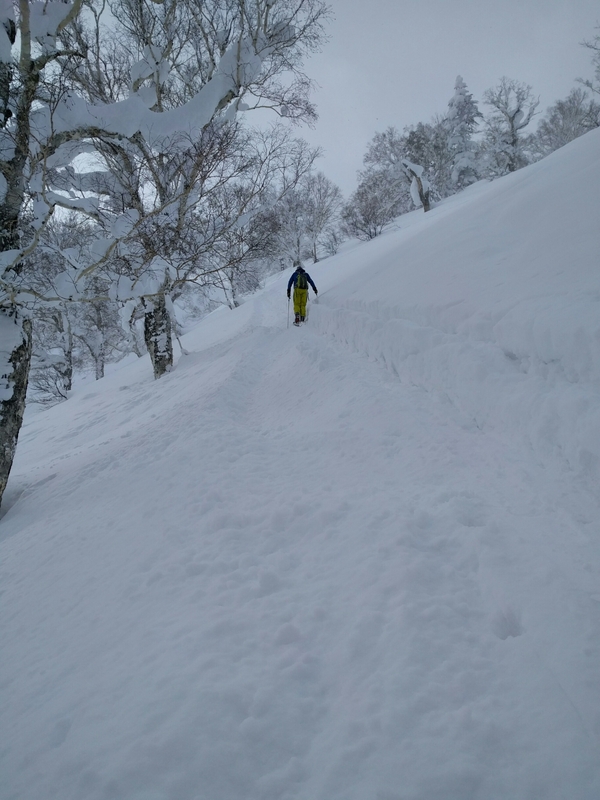 Hirafu and Hanazano attract most powder hounds, so we found some of the best in-bounds snow at the end of the day skiing back to the Niseko Village base. One day was plenty. We would avoid on future trips.